A group of secondary school students from across Dublin gathered in front of the Dáil yesterday to call on the Government to up its game in tackling climate change. The lunchtime rally was one of many held around the world as part of Fridays for Future, an action inspired by fifteen-year-old Swedish climate activist and student, Greta Thunberg. The youthful protesters’ chanted for immediate steps to be taken by our decision-makers to stop fossil fuel extraction and to “keep the carbon in the soil”. “It has to start with young people, and all the lads are really enthusiastic about following on with things like this,” according to fifth-year Belvedere College student Ray Taylor, who attended the protest with his science teacher, Michael Grehan. “We are here today from different schools in North Dublin, South Dublin, West Dublin,” Mr Grehan said as the protest was underway. “I think that’s a powerful symbol that the young people are saying to the elders and politicians that the time has come to take much more urgent action,” he added. Students in Cork under the Cork Fridays for Future Strikes name have also protested outside of Cork City Hall on Fridays over the past three weeks. 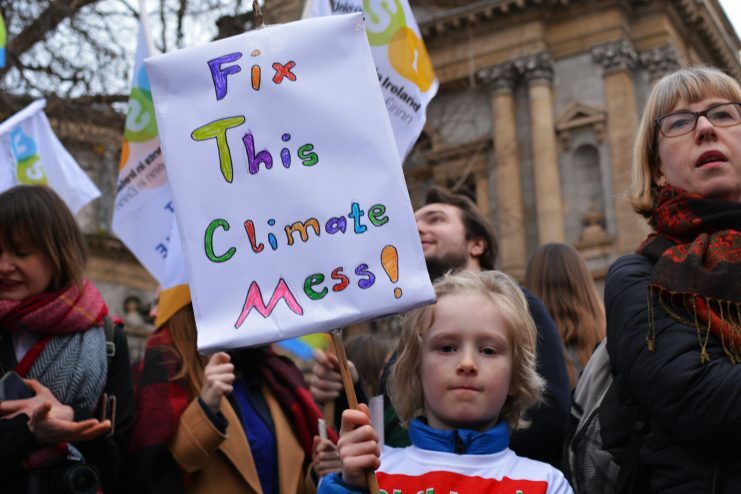 The Dublin roll-out of Fridays for Future was launched last December by concerned parents including climate activist and author Dr Lorna Gold as an “impromptu thing in response to Greta Thunberg”. “I was in touch with a few people who had read my book, Climate Generation. Some of them were teachers, and they were the first ones who decided to come along before Christmas,” she said. A group of students protesting can be found in front of the Dáil every Friday between 1 and 2 pm and Dr Gold hopes that future action will continue to garner students’ interest. In August, Thunberg started a global movement by going on strike from school and sitting outside the Swedish Parliament to demand greater action on tackling climate change. Since then, thousands of schoolchildren in Australia, Belgium, the US and other countries have walked out of class on Fridays to demand climate action from their Governments. Earlier this month, hundreds of young protesters rallied in front of the Dáil to call on the Irish Government to immediately address the growing threat of climate change. The Children’s Rally for Climate Action was organised by Climate Case Ireland (CCI) who last week took a high profile climate case against the Irish Government in the High Court.